Cody Lips is just your average elementary schooler until, on his first day of fourth grade, he realizes his school has made a terrible mistake-they’ve placed him in Mrs. Piper’s Talented and Gifted class! Cody is certain that he is neither talented nor gifted. Between his new classmates and impossible math lessons, it seems like nothing is going Cody’s way. 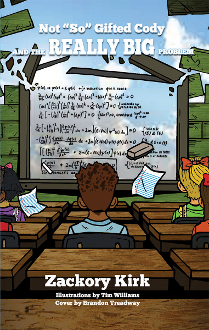 And just when things couldn’t get any worse, he has to work harder than ever to help his class compete in Turtle Town Elementary’s annual Mathathon. Why can’t things just go back to the way they were? Now, “Not “So” Gifted Cody” must make new friends and face new challenges to survive the fourth grade and realize his true potential.